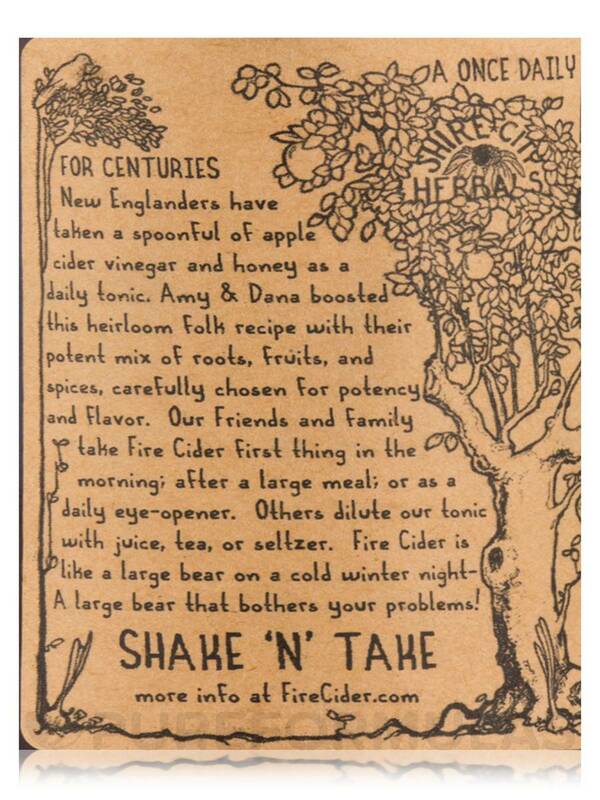 For centuries‚ the inhabitants of New England drank a daily tonic of apple cider vinegar and honey. Amy and Dana boosted this traditional recipe with a synergistic mixture of whole roots‚ fruits and spices for maximum potency! 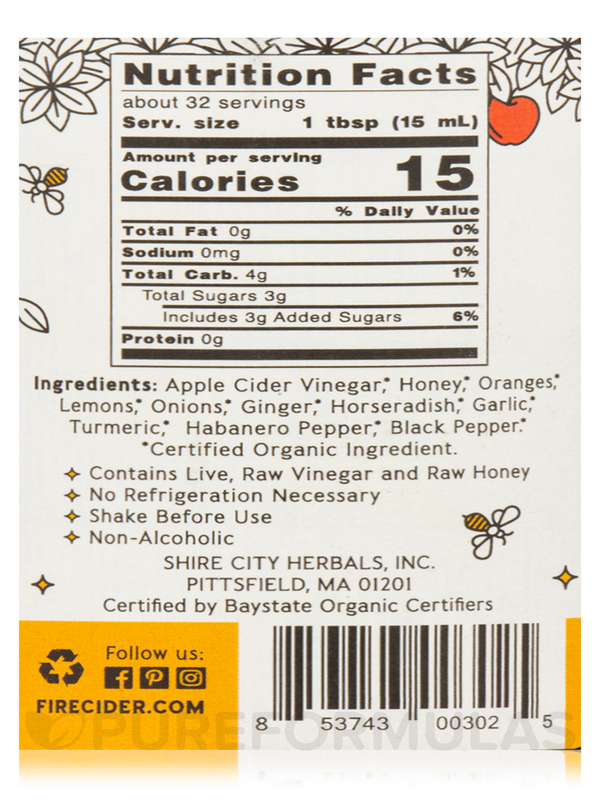 This Fire Cider starts with apple cider vinegar‚ lemons‚ oranges‚ onions‚ ginger‚ garlic‚ horseradish‚ habanero pepper and turmeric‚ all raw and Certified Organic. After six weeks steeping‚ a generous portion of raw wildflower honey from a 3rd generation‚ family-run apiary in Billerica MA is blended. No heating is ever involved‚ so the unique properties and delicate flavors of the ingredients are preserved. A tablespoon is recommended daily as a dietary supplement. 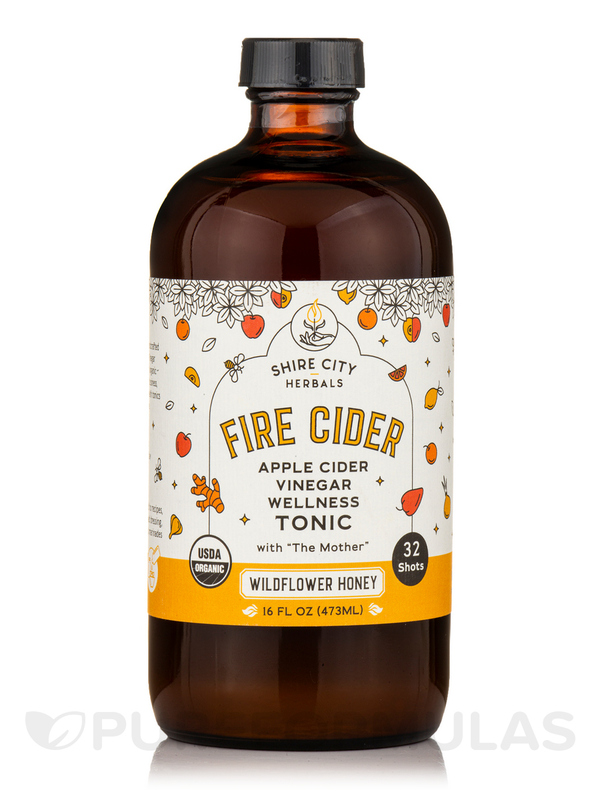 Try Fire Cider straight from the bottle; with juices‚ soda water‚ or tea; in a salad dressing; or in a fierce Hot Toddy. Get creative! 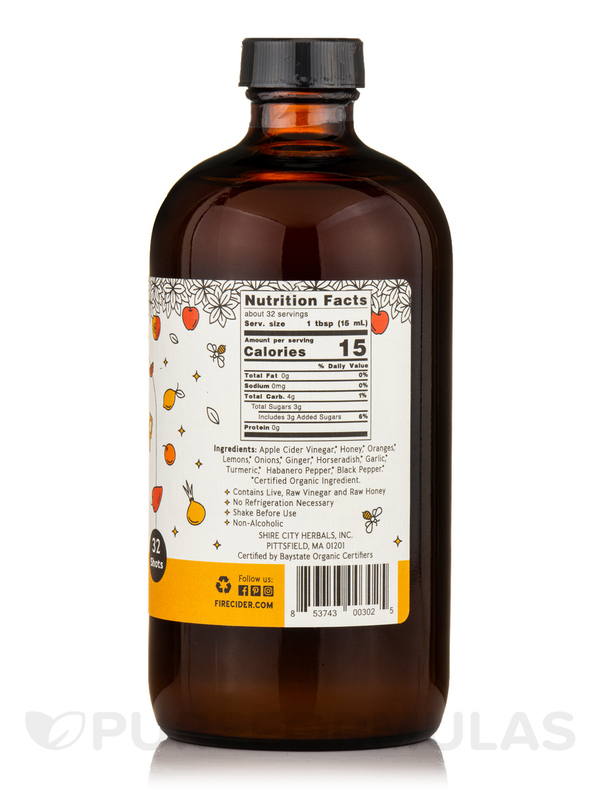 Ingredients: Apple cider‚ vinegar*‚ honey*‚ oranges*‚ lemons*‚ onions*‚ ginger*‚ horseradish*‚ garlic*‚ turmeric*‚ habanero pepper*. 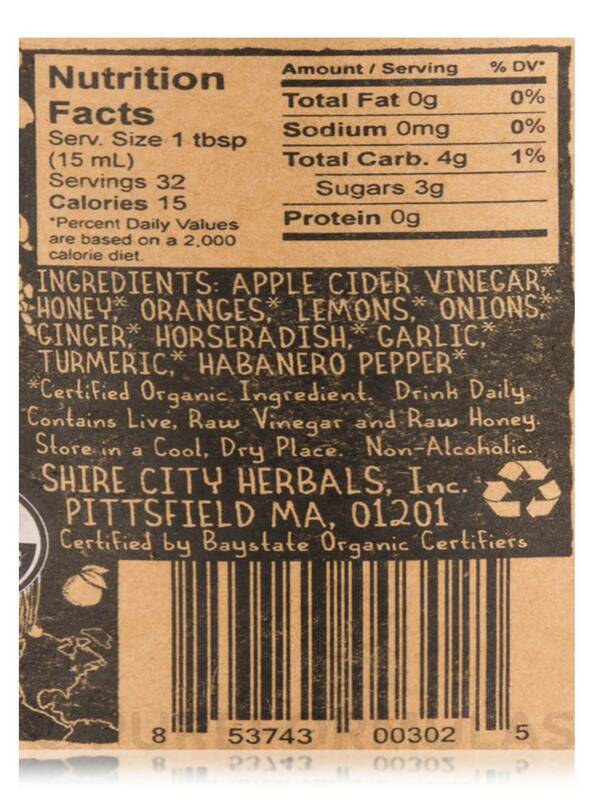 Notice: Contains Live‚ Raw Vinegar and Raw Honey. It is vinegar, no matter what you sometimes I find it hard swallow, but I know I will feel better ,so just do it ! 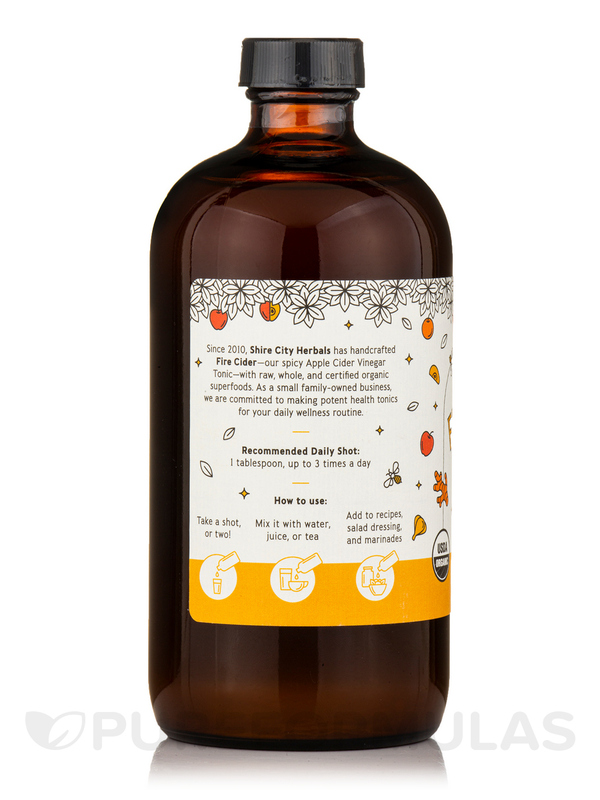 Apple Cider Vinegar on Steroids! 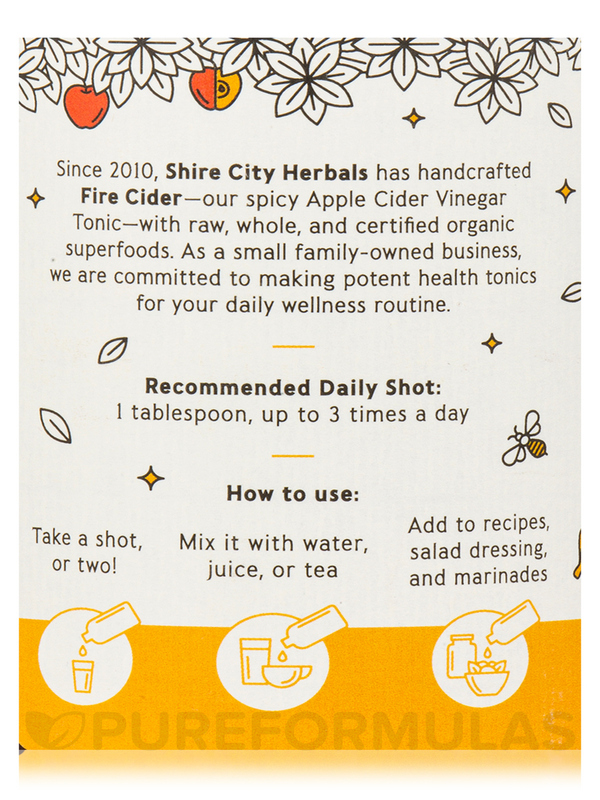 Apple Cider Vinegar and Honey Tonic by Fire Cider is a high quality product. All organic ingredients used. We take a shot of this first thing in the morning. The live enzymes feed your immune system. It is all about keeping your immune system strong to fight off whatever comes your way. Can't remember the last time I had a cold. Sometimes out of stock and significantly more expensive than Braggs organic apple cider vinegar.